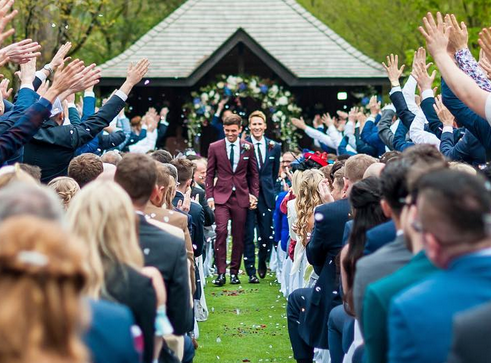 British diver Tom Daley, 22, and film writer and director Dustin Lance Black, 42, got married this weekend. 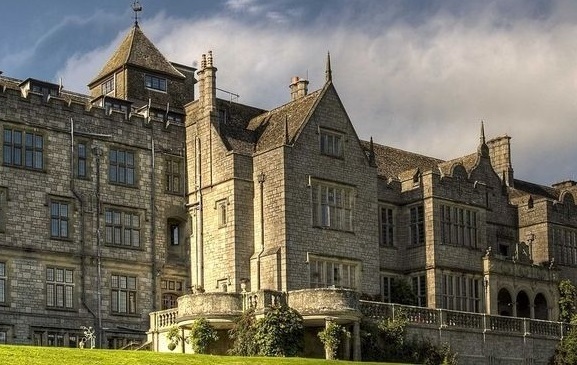 The 120-person wedding took place in the Bovey Castle, about 30 miles from Daley’s home town in southern England. In what the local paper described as a “beautiful ceremony,” a string quartet played the couple down the aisle and the London Gay Men’s Choir sang Bruno Mars’s “Marry You” when their union became official. After after eating English food and homemade cake in psychedelic colors, attendees toasted the couple and heard speeches by people in the wedding. Daley’s mother Debbie gave a speech that included a tribute to his father Rob, who passed away in 2011. A fireworks display at 10 ended the ceremony and opened a night of dancing. Daley revealed that they were a couple in 2013 in a YouTube video, and they announced their engagement in 2015.